Geek Lit Etc. : Manga Monday: How deep does the conspiracy go? Manga Monday: How deep does the conspiracy go? The identity of the Female Titan is discovered, and the mystery of the Walls deepens in Attack on Titan Volume 8. Note: Attack on Titan Volume 8 is part of an ongoing series. Check out the review for Volume 1 here, and Volume 7 here. Otherwise, read on! Eren still wants to believe the best of people. It simply goes against his nature to think that people that he trained with, people who have sworn to protect this last settlement of humans, could really be the Abnormal Titans that have killed so many. But as the evidence against one of their own continues to mount, there is nothing to be done but set Eren up as bait, and see what happens. 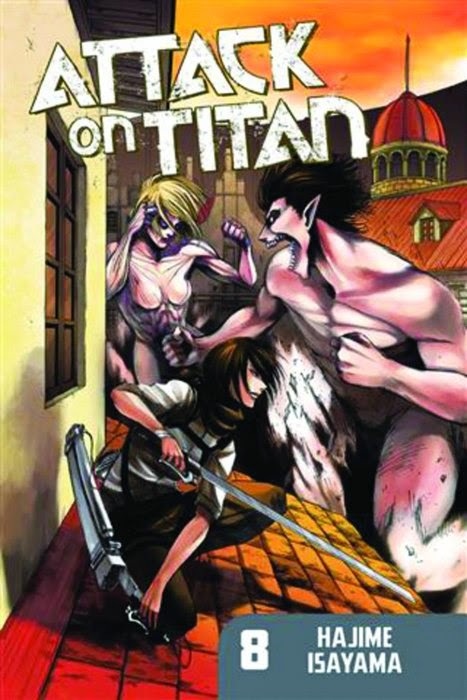 And when the time comes, will Eren be able to call on his Titan powers to battle one of their own? As the two Abnormal Titans battle within the city of Stohess, the Wall is damaged. The Wall, who a segment of the population worships as a God. The Wall, which protects these last, few scraps of the human race from the horrifying fate of the Titans. The Wall, which might not be all that it seems. Eight volumes in, Isayama is still deepening the mystery that surrounds the walled cities. When many manga series are beginning to repeat themselves and become dull, Attack on Titan is only beginning to unfold. Highs: It's so painful to watch Eren be betrayed, when he truly still believes in the good in people. Verdict: As Isayama shines a light on of the mysteries haunting the Survey Corps, he makes sure to give us plenty more to wonder about.